Root canal therapy is performed when the pulp which is composed of nerves and blood vessels in the tooth becomes infected or damaged. 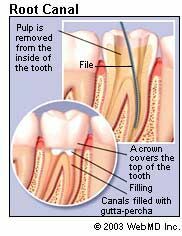 During root canal therapy, the pulp is removed, and the inside of the tooth is cleaned and sealed. People fear root canals because they assume they are painful. Actually, most people report that the procedure itself is no more painful than having a filling placed. The discomfort experienced in the period leading up to seeking dental care is truly painful, not the procedure itself. A tooth's nerve is not vitally important to a tooth's health and function after the tooth has emerged through the gums. Its only function is sensory -- to provide the sensation of heat or cold. The presence or absence of a nerve will not affect the day-to-day functioning of the tooth. However, after treatment the tooth is less viable and more susceptible to fracture. Once the tooth is thoroughly cleaned, it needs to be sealed. Some dentists like to wait a week before sealing the tooth. 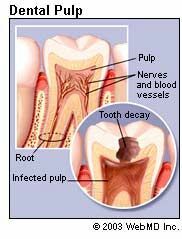 For instance, if there is an infection, your dentist may put a medication inside the tooth to clear it up. Others may choose to seal the tooth the same day it is cleaned out. If root canal therapy is not completed on the same day, a temporary filling is placed in the exterior hole in the tooth to keep contaminants out between appointments. At the next appointment, to fill the interior of the tooth, a sealer paste and a rubber compound called gutta-percha are placed into the tooth's root canal. To fill the exterior access hole created at the beginning of treatment, a filling is placed. The final step may involve further restoration of the tooth. Because a tooth that needs root canal therapy often is one that has a large filling or extensive decay or other weakness, a crown, crown and post, or other restoration often needs to be placed on the tooth to protect it, prevent it from breaking, and restore it to full function. Your dentist will discuss the need for any additional dental work with you. Root canal therapy should relieve the pain you feel. Until your root canal procedure is completely finished -- that is, the permanent filling is in place and a crown, if needed, is in place -- it's wise to minimize chewing on the tooth under repair. This step will help avoid recontaminating the tooth’s interior and also may prevent a fragile tooth from breaking before the tooth can be fully restored. For the first few days following the completion of treatment, the tooth may feel sensitive due to natural tissue inflammation, especially if there was pain or infection before the procedure. This sensitivity or discomfort usually can be controlled with over-the-counter pain medications such as ibuprofen (Advil, Motrin) or naproxen (Aleve). Most patients can return to their normal activities the next day. Sometimes re-treatment can be successful. Other times, endodontic surgery must be tried in order to save the tooth. The most common endodontic surgical procedure is an apicoectomy, or root-end resection. This procedure relieves the inflammation or infection in the bony area around the end of your tooth. In this procedure, the gum tissue is opened, the infected tissue is removed, and sometimes the very end of the root is removed. A small filling may be placed to seal the root canal. The cost varies depending on how severe the problem is and which tooth is affected. Many dental insurance policies cover endodontic treatment. A ballpark estimate for the root canal treatment itself (not including a dental restoration following the procedure) performed by a general dentist could range from $350 to $540 for an incisor and $520 to $800 for a molar. The fees charged by endodontists could be up to 50% higher. Saving your natural teeth is the very best option, if possible. Your natural teeth make it possible for you to eat a wide variety of foods necessary to maintain proper nutrition. Root canal therapy is the treatment of choice. The only alternative to a root canal procedure is having the tooth extracted. The tooth would then be replaced with a bridge, implant, or removable partial denture to restore chewing function and prevent adjacent teeth from shifting. These alternatives not only are more expensive than a root canal procedure but require more treatment time and additional procedures to adjacent teeth and supporting tissues. Since some of the reasons that a tooth’s pulp becomes inflamed and infected are deep decay, repeated dental procedures on a tooth, and large fillings, following good oral hygiene practices (brushing twice a day, flossing and using an antiseptic mouthwash at least once a day, and scheduling regular dental visits) may reduce the need for a root canal procedure. Trauma resulting from a sports-related injury can be reduced by wearing a mouth guard.